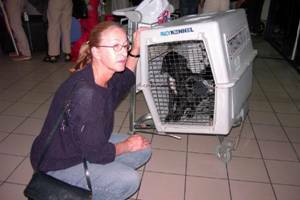 Transporting sick and injured animals. Donations of dog leads, collars, blankets, etc. Maybe you belong to a dog-training club and could organise a collection on our behalf? You could consider having a boot or tabletop sale and donating the proceeds to the Ark. Why not become a member and encourage friends, colleagues and relatives to do the same? We are constantly looking for permanent adopters and short-term foster homes for our rescued dogs and cats here in Corfu. The cost of transportation, feeding and any medical treatment will be taken care of by the Ark. If you would like to give a dog or cat a permanent and loving home or would be prepared to foster for a short period, 3-4 weeks maximum, please call 26610 80308. Tourists occasionally contact the Ark to see if we can assist them in adopting a dog they have befriended in Corfu and would like to take back to their home country, usually Germany or Holland. 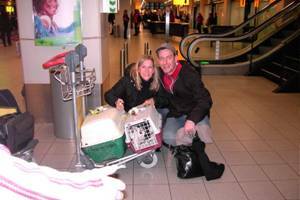 It is usual practice for the adopter to take the animal themselves. Often the time is too short to have the necessary vaccinations. Then we need the help of a tourist who is willing to accompany the dog on his way back to the owner waiting for the animal at the other end. Of course we will assist with everything at this end. 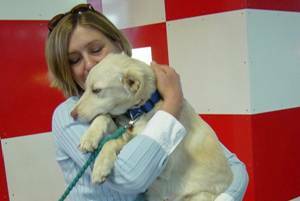 The cost of medical supplies such as flea treatments, worming, etc. is a considerable drain on our limited resources. If you have unused products, including wound dressings, which you no longer require, perhaps you would consider donating them to the Ark? We can arrange to collect them or you can take them to our shop in Corfu Town. If you do not live in Corfu but would like to send small parcels, you can address them to The Ark, P.O. Box 484, Corfu, 49100 Greece. 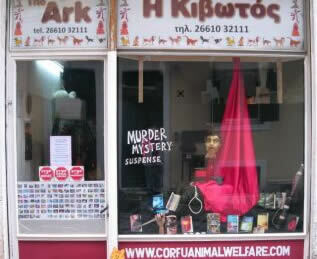 When in Corfu Town why not visit our charity shop and information centre. It is located at 11 Ag .Dimitriou Street. To get there turn right immediately after the Hondos Centre, continue to the end and then turn left. 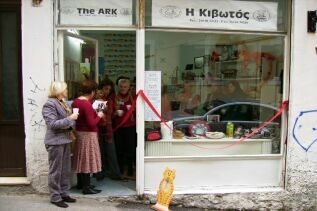 The shop is identified by the Ark logo and is open on Tuesday, Wednesday, Thursday, Friday and Saturday from 10.00 - 13.00. The telephone number is 26610 32111. You can browse through the articles for sale including Household Goods, Toys, Clothing, Books, Cds and Cassettes and a "Bargain Rail". There is sure to be something of interest. In addition, you will find a range of leaflets covering many aspects of pet ownership. A warm welcome from our staff awaits you. The shop always welcomes contributions of all kind of articles. Any items (in good condition) can be dropped of at the shop during opening hours. 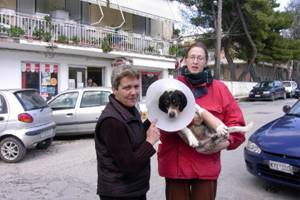 Volunteers for the shop and/or car boot sales are greatly appreciated and help boost funds for the stray and abandoned animals of Corfu. Please contact us if you are able to offer your services. The free use of this shop has been kindly given to us by Nenna Gerondikou in memory of her aunt Elli Papavlasopoulou. If you have any good items such as clothes, crockery, books, etc. which you do not need anymore, please let us know as we always welcome good quality items. Phone Christiana on 6941504182 (English, Greek) or 26610 32111 (Greek only).